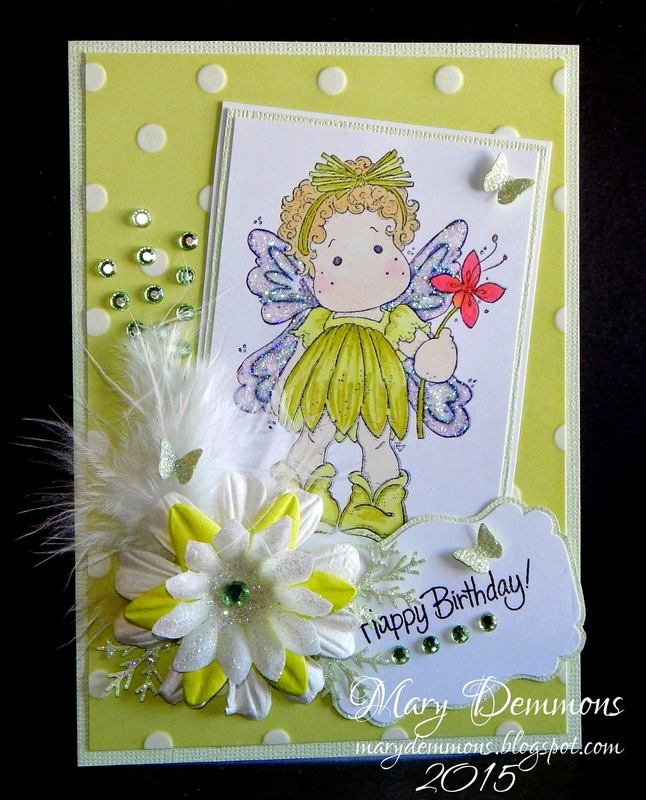 I created this spring birthday card for a friend who celebrated her birthday this past Thursday. The image I used is Summer Flower Tilda. I added a piece of lime green dot patterned card stock to a piece of white wash green gate card stock and then added it to a white card base. I colored the image using Spectrum Noir pens and backed it in white wash green gate and white card stock. To create the flower I added a white glitter fabric daisy to a lime green paper flower and then added that to a white paper daisy. I added a grass green rhinestone to the center. I added a white feather behind the flower. I punched 3 branches out of white wash green gate card stock and added them in behind the flower. I added 3 rows of grass green rhinestones coming out from behind the feathers. I stamped the sentiment onto white card stock, punched it out using a real estate punch, backed it in white wash green gate card stock and added 4 grass green rhinestones under the sentiment. I punched 3 mini butterflies out of the white wash green gate card stock. I added 1 to the sentiment, 1 to the image and 1 to the feather. I added stardust stickles to the butterflies, branches and to Tilda's wings. Super adorable card and image! Thanks for joining us at Craft Hoarders Anonymous. Hi Mary, this is just adorable! Your friend will LOVE it! Great coloring. Thanks so much for joining us over at the 2 Cute Ink "glitter" challenge. Good luck with all your challenges. I hope you will come back and join us again! This is just so cute! Thanks for joining us at Craft Hoarders Anonymous! What a sweet image and really great spring colourway. What a gorgeous card! Love the colours and the huge flower! Thanks so much for joining us at Magnolia Mania. OH my sweetness! So adorable! Thank you for joining our challenge this week over at 2 Cute Ink. Hope to see you join us again! Sweet card! Love that green. Thank you for joining us at 2 Cute Ink Challenge Blog. This is a fabulous card, beautifully embellished. Fabulous spring card. Thanks for sharing with us at Craft Hoarders Anonymous! Nice card. Thank for joining us at Craft Hoarders Anonymous. Your card is very gorgeous ! Thanks for joining us at Paradise of Magnolia. So sweet and adorable! Thanks for playing in our final challenge at Craft Hoarders Anonymous!